AT&T Launches Cloud Data Backup and mobile access service. The new service, called 360 Backup and Go, lets mobile users store material within AT&T’s network cloud that would normally be stored locally on a hard drive. End users can easily retrieve documents through a Web browser and also have the option of sharing documents with colleagues and supply chain partners by providing them with a Web link and a log-in credential, said Ebrahim Keshavarz, vice president of business product management for AT&T. It will also be focused on small to medium sized businesses. 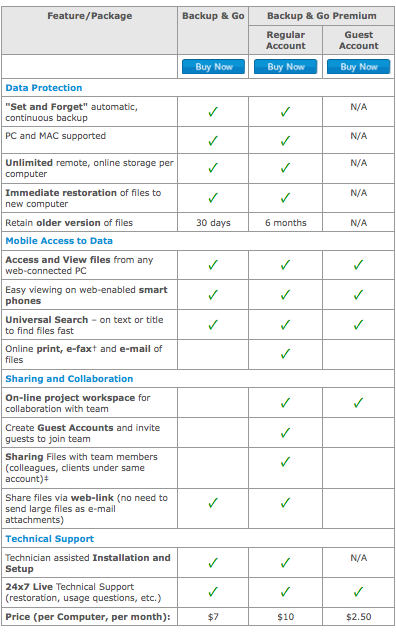 Pricing for the 360 Backup and Go service begins at $7 a month for unlimited backup and storage of PC data and remote access. A premium service, costing $10 a month, adds data archiving and collaboration features, such as the ability to e-mail files directly from online storage or maintain older versions of files with version control for up to six months. Backup and Go gives you unlimited online data backup with 24/7 remote access, virtually anywhere. Now you can be productive in the office and just about anywhere else. With a Backup and Go subscription you get automatic and continuous backup of data from your computer to a remote online personal storage area. The new offering builds on AT&T’s previously announced Tech Support 360 offering that acts as a computer help desk for small enterprises. Both 360 services are “part and parcel of remote computing for small businesses,” Keshavarz said. A standard package called Backup and Go and a full-featured package called Backup and Go Premium. With Backup and Go Premium you can create your own online project space and invite team members to work together on documents.